Ribbon bows are used on everything from hair ribbons to the bows on packages. Different types of ribbons offer opportunities to bend the bows into unique shapes and ruffled ribbons make a bow seem twice as full. 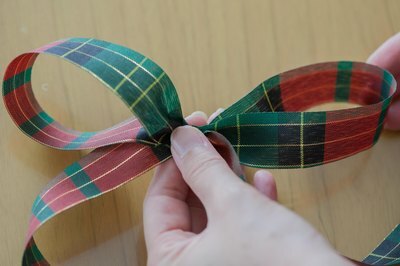 Learning how to make a basic ribbon bow is key to creating unique and different bows that express your style. 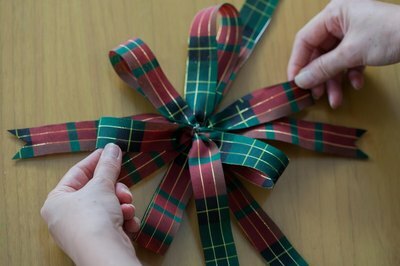 Start with a grosgrain ribbon since this ribbon type is less likely to fray while you are twisting the ribbons. To avoid fraying, cut the ends at an angle. 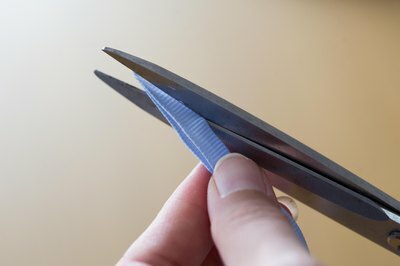 Cut the ends of a yard of grosgrain ribbon at an angle or in an inverted V shape using scissors. Allow 6-inches for your ribbon tail. Make loops in the ribbon. Start out small and then allow your loops to get larger and larger. A floral style bow will have loops from large to small and it is the basis bow for many bow styles. Pinch the area of ribbon between the loops to hold the loops in place while you work. When you have 6 to 8-inches of ribbon left, wrap 26-gauge bow wire around the pinched area. Leave 3 to 4 inches of wire tails to help you attach your bow to other bows or objects. Fan out your ribbon. Position your larger loops at the bottom and as you make the bow into a mound shape, the loops at the top will be the smallest loops. The ribbon tails or ends should hang down. Often one will be longer than the other. Make three floral bows as described above except that you will reduce the length of your ribbon by six and twelve inches. Make your first bow the full size and keep your loops larger. Make your second bow smaller beginning with 2 feet and 6 inches of ribbon. Start with loops smaller than those of your first bow. Make your third bow the smallest. Start with 2 feet of ribbon and make all of your loops small. Fan out each bow individually and then position the small bow on top of the medium bow, on top of the largest bow. Thread your extra wire down through the center of the bows and twist them together. Adjust you loops and you will have a bow that has 6 tails and it may be almost completely round and very full in shape. These are very extravagant bows. Once you are comfortable with how to make very full bows try working with wired ribbon and other types of ribbons to create very different looks. 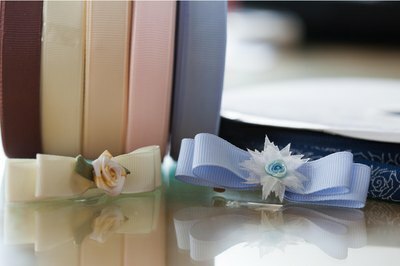 The center of a layered floral bow can be make of seed pearl ribbon and the layer in between can be a organza. These make luxurious looking bows suitable for packages or decorating.